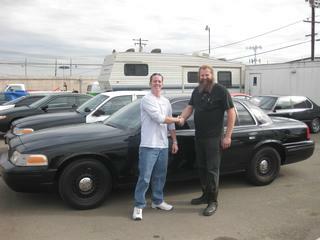 Wild Rose Motors - Policefleetonline.com Selling Used Cars in Anaheim, CA. Well... I have finally broken the 25.5 MPG mark and recently got 26.1 on a trip to Utah. I now have put over 4,000 miles on this vehicle. It was amazing to me how such a large car with all the horse power could get such great fuel mileage on the highway. This car has proven to be very comfortable on long trips especially now that I have factory cruise control which only requires the addition of just one item: a factory steering wheel with switches and then to get Ford to update the stock programming to show a cruise control installed to the ECM. I would highly recommend this upgrade for the 2006 and up vehicle since it was so easy which is probably due in part to the factory "Fly-By-Wire" throttle available from mid 2005 on up. So far I am happy to have purchased this vehicle from you and am looking forward to doing further business with you and your great staff in the future. 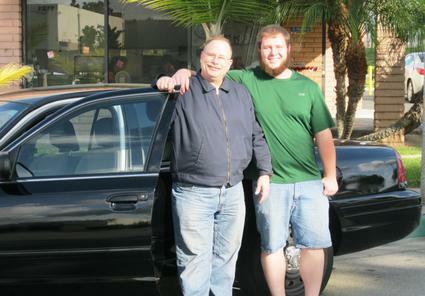 Morgan Langley with his nephew, at our new location in Anaheim, CA. After getting ''Steve'' (the name my daughters gave the car) washed, I noticed marks from the OCTA stickers that had previously been on the car. I gave a good friend, who is an OC Airport/Transit Authority Office, a call and mentioned it to him. He laughed and said maybe it was one of his old cars. He went on to tell me about how great the CVPI's are, how well they perform and how much safer they are than other cars. He told me about an accident two officers were involved in with a brand new CVPI. They were t-boned in an intersection by a car going approximately 60 mph that ran a red light. Both officers walked away from the crash with only minor injuries. He told me that he's sorry to see Ford discontinue the CVPI. He said the Dodge Chargers, while fast, are not holding up to service duty requirements and they are too small for most officer's comfort. So, you picked the right product! It's nice to know that in this day and age there are still people in the world that are still willing to help the little guy. Someone once told me that you get back what you dish out times ten. I can say with confidence that Seton will have a long and prosperous life because of the things he has done in his lifetime up to this point. 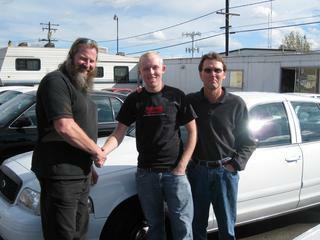 Thank you Steve and I hope to do more business with wild rose motors in the future. We can provide you with a fleet too! We specialize in Ford Crown Victoria Police Interceptors and can have them painted & equipped to fit your needs. Right off the bat I have to say that seeing this many wonderful testimonials and having my own wonderful experience as well really says something about what the family and friends over at Wild Rose do for their customers. From beginning to end there wasn't a moment that I wasn't treated kindly and with whole hearted respect. I was greeted with a kind smile and helping hand and we all even shared a few laughs while going through the rest of the process. 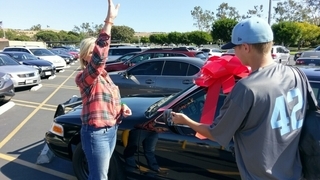 I'd have to say that not just in buying a car, but as an experience in general, I was so glad and am still very excited that I've been able to be a part of that wonderful moment. I look forward to sharing more time and laughs with my friends over at Wild Rose and if you or any of your friends are looking for a true personal, fun experience as well as quality service and vehicles, there is no where else I would rather recommend. Thank you again to everyone who made my experience memorable and I look forward to seeing you all soon! I am looking for an interceptor because my Dad is a retired L.A. County Sheriffs Officer and he told me that they are the best car for a first car. 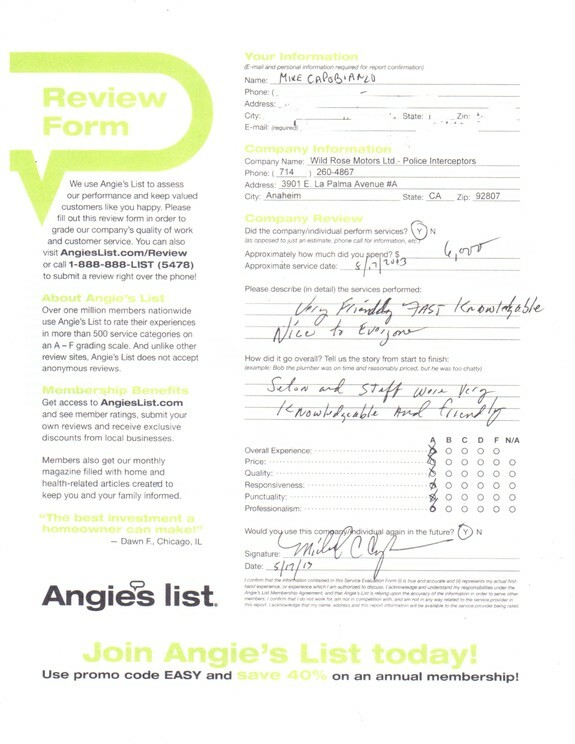 They are extremely well taken care of and really safe. I would like info on this car and any others you have. I need a car desperately and this is where my Dad told me to look. Wild Rose Motors is the best place to start your search for a P71 Interceptor. Steve is one of the friendliest guys I have ever met. He is extremely knowledgeable when it comes to these cars. If you need anything he will help you out. Steve isnt like other salesmen. There is absolutely no pressure like at other dealerships. 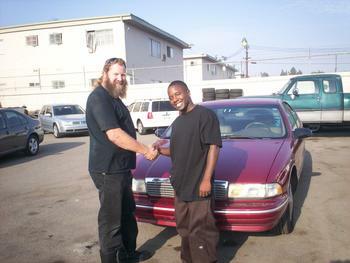 He is very kind and lets you browse and test drive whatever P71 catches your eye. 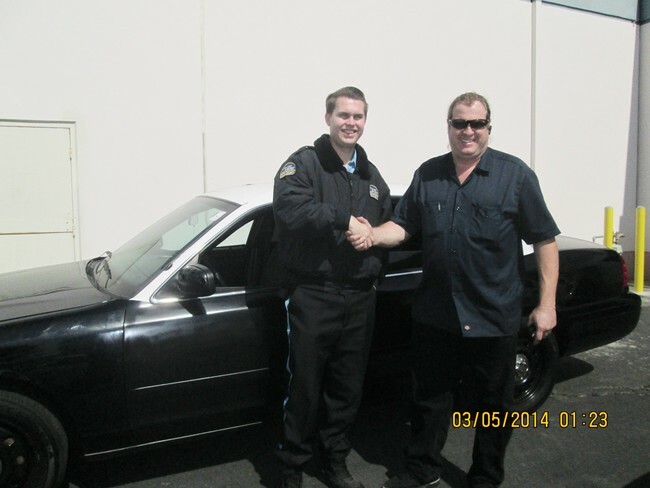 ; If you are in the market for a CVPI, you MUST stop by Wild Rose Motors, you wont regret it! I have wanted to drive everywhere since I bought this car from you guys. Seton, you really outdid yourself on this deal. 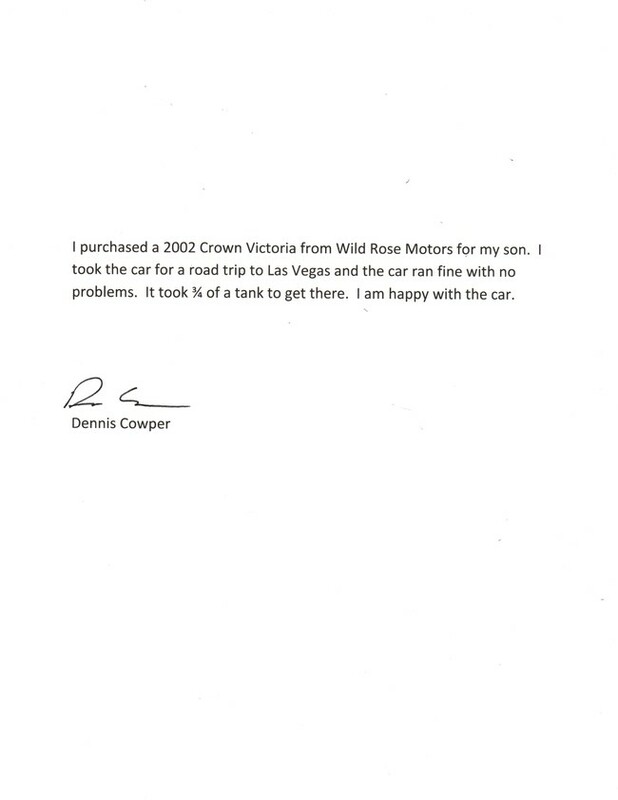 The experience of the purchase was unlike any other car buying experience I have ever had. I am already looking forward to the next cruiser that I get from you. This car has it all and is more than I had expected. That, and the comfort of knowing its a quality vehicle that will last me for a long time. Thank you for your candor and honesty. I recommend to anyone looking for a great used police interceptor to visit you first. Thank you again! This past Spring, after searching the country for a Police Interceptor that met my expectations, I found a 2003 Ford P71 at Wild Rose Motors that was everything I hoped for. I was so impressed with the deal and the after-sale service, I wrote a testimony to my experience with Steve Montgomerie and his crew. My name is Victor, but if you've read the testimonials written for Wild Rose Motors, you may know me better as 'Cynical Old Fart'. A couple of months after buying the P71, I hit the road on a cross-country journey with more than 87,000 miles showing on the odometer. Although I had owned a Police Interceptor with mileage in the past, I had never travelled long distances in it. Until this trip, I didnt know what I had been missing. The P71s high performance suspension and front-end took to the asphalt with a sure-footedness and confidence that was a pleasure to experience. Even under a very heavy load that forced the car to shift into passing gear for long periods when climbing mountains, the super-duty cooling system kept the powerful Interceptor V-8 running cool and smooth, never missing a beat for twelve hundred miles! As satisfying as the Interceptors performance was, I have to admit that I also came to relish the public's reaction to the car. Wherever I stopped, the P71 attracted admirers. Within the first couple of months after arriving in Amarillo, Texas, where I'm visiting family, I had five offers to sell the car, including one from a local constable. I enjoyed the compliments, but no other car I might buy would provide the safety, the performance, the reliability, the good looks, and the unique pride in ownership that a Ford Police Interceptor gives to those who drive them. I owe so much of my satisfaction with this car, though, to my decision to buy from Wild Rose Motors. 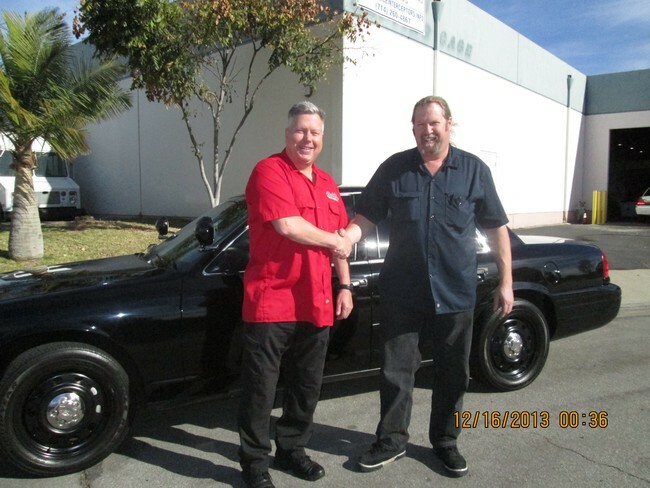 Steve Montgomerie is a Police Interceptor enthusiast who hand picks only clean, dry, well-maintained units from Southern California agencies. He doesnt settle for less, and neither do I. My P71 has recently sailed past 90,000 miles, just in time for the car and I to hit the highway on another cross-country adventure. I will catch up with you down the road. 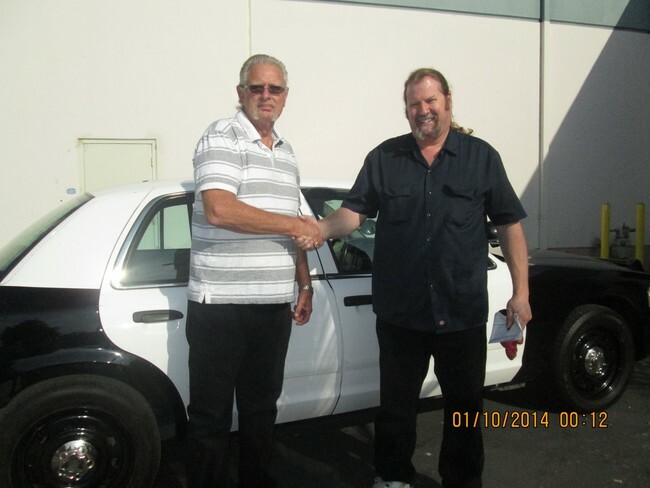 Located in Fullerton, CA, Wild Rose Motors is a supplier of retired police interceptors. Wild Rose purchases only the best police vehicles; it services them, details them, and fits them to meet customers specific needs. Clients include the FBI, ranger departments, probation departments, police departments, security and fire companies, as well as the general public. Wild Rose sells Ford Crown Victorias, Chevrolet SS Impalas and Chevrolet Caprices. All vehicle selections and services are done in house with 25 years of experience. General Manager Seton Montgomerie talked to PFM about Wild Roses services. Once a car arrives at Wild Rose Motors, it goes through a full-service mechanical inspection. Montgomerie said he replaces anything that could fail or is nearing its end of life, including hoses, oil ring seals, radiators, or anything for preventative maintenance. The company always changes the engine oil and filter and uses only premium quality products, such as Valvoline VRI, a racing-grade oil, and Mobil 1 Synthetic for transmissions. Rebuilt engines and transmissions are installed if the vehicle has a mechanical defect or if the customer requests it. 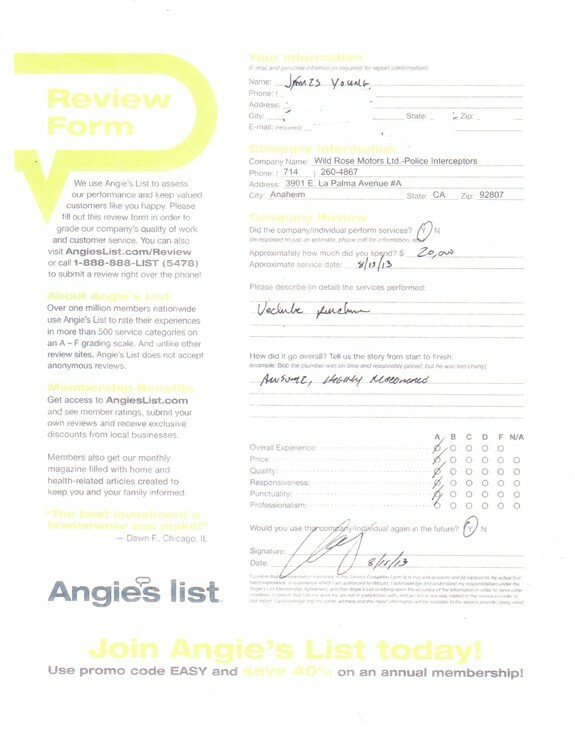 Additional services include checking the spark plugs, wires, air filter; throttle body plate intake and cleaning; engine and transmission mounts checked and/or replaced; transmission service; filter and gasket change and inspection; refills with high-quality Dextron3 fluid; replace exhaust mounts; limited slip rear-end fluid replacement as required. Brake service includes a pad replacement and flush, plus diagnostic checks on all systems. The most important aspect of the Crown Victorias is the high-speed interceptor package containing a high-performance engine, twin cam, multi-point injected V-8, a high-performance computer, a 120-amp heavy-duty alternator, a heavy-duty water pump, an external, aircraft-quality engine, two transmission coolers, a double-fan radiator cooling system and a heavy-duty radiator. In addition, theres a heavy-duty, four-speed electronic transmission and an extra capacity transmission, limited slip high-ratio rear end, and super-duty ABS four-wheel disc breaks. Wild Roses Chevy SS Impalas and Caprices are equipped with the high-speed performance Corvette engine 5.7 liter, multi-point injector V-8 or V-6, a high-performance computer, a 120-amp heavy-duty alternator, a heavy-duty water pump, an external engine cooler, two transmission coolers, a double-fan radiator cooling system and a heavy-duty radiator. These vehicles also have a 700R heavy-duty Corvette transmissions; limited slip high-ratio rear end; super-duty ABS four-wheel disc breaks; heavy-duty high performance, ventilated rims that are 1 inch wider than standard; Goodyear Eagle RSA 225-70, Z rated tires; super-duty good-performance suspension package; front and rear sway bars with heavy-duty suspension bushings; heavy-duty shocks and springs; and high-performance twin tuned exhaust. Safety features include high-impact-reinforced impact bars, drive shaft and universals. Wild Rose contracts out to a paint shop for repainting two-tone police cars to solid colors, or per customers requests. All cars are sanitized in addition to being cleaned and detailed. Carpet and upholstery are replaced as needed, so the car is as close to new as the customer?s budget allows. The majority of Wild Roses vehicles are from California. Montgomerie calls West Coast cars ?superior? due to the good weather and roads in that region of the country. He went on to say that a 5-year-old car in New York has had its life, whereas a car the same age in California might have many more good years left. Thats why Wild Rose does not deal with out-of-state vehicles, again due to potential problems such as corrosion. Montgomerie said legislation in California is strict, so he hand picks every vehicle to ensure that he gets the best vehicle possible. He has worked with agencies from Orange County, CA for many years due to Wild Roses good reputation for giving officers fair deals and the respect they deserve, Montgomerie said. Wild Rose sells to many different departments for both patrol use and take-home fleets. Montgomerie works with small departments on tight budgets, even giving them deals such as three for the price of one. He gives discounts to law enforcement, government offices, and the military to show the appreciation for the jobs they do. The Marines have used his cars for training purposes. Montgomerie said a lot of families with teenage drivers have been buying used police cars because of the safety factor. Parents with young children also like the fact that the Ford CVPI can fit three car seats across the back seat. Many of Wild Roses customers are people who have been in accidents and now want a safer car. Vehicles found at Wild Rose typically have 50,000 to 90,000 miles on them. The company does not place a cutoff age on its cars, but it usually deals with Ford Crown Victorias from model years 1997 to 2005. Chevy Impalas range from 1993 to 1996. Nearly new vehicles are also available if a customer requests one. A 2-year-old CVPI with 85,000 miles would sell for $9,980 at Wild Rose Motors. A Fleet Replacement Program is also available. Montgomerie said his cars are all ready to go. If a customer needs 10 cars tomorrow, he can supply them. He also offers negotiated contract rates and fleet discounts for the more you buy. The company ships cars all over the country and as far as Australia. 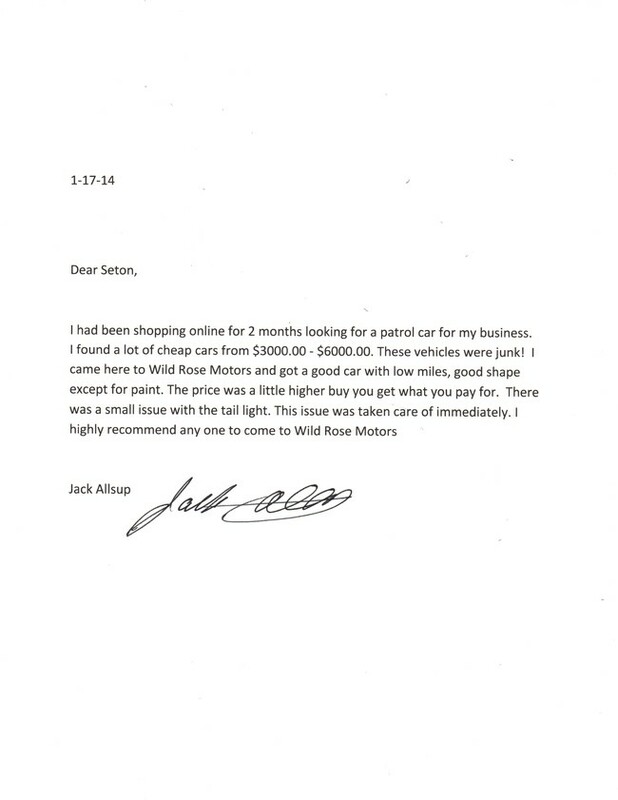 Though a small company, Wild Rose Motors prides itself on high-quality customer service. Originally from New Zealand, Montgomerie said he brought his business sense from there. He once had a client whose wife was stuck on the freeway with car trouble drove out to help her. Thats PR that money cant buy, Montgomerie said. The company sells a large volume of vehicles based on word of mouth alone. Montgomerie will pay a $100 finders fee to anyone who refers someone to his shop. Recently my Director asked me to purchase a previously-owned Crown Victoria Police Interceptor to be used as a technology test bed for the major world-class Aerospace Corporation that I work for in Raleigh, North Carolina. 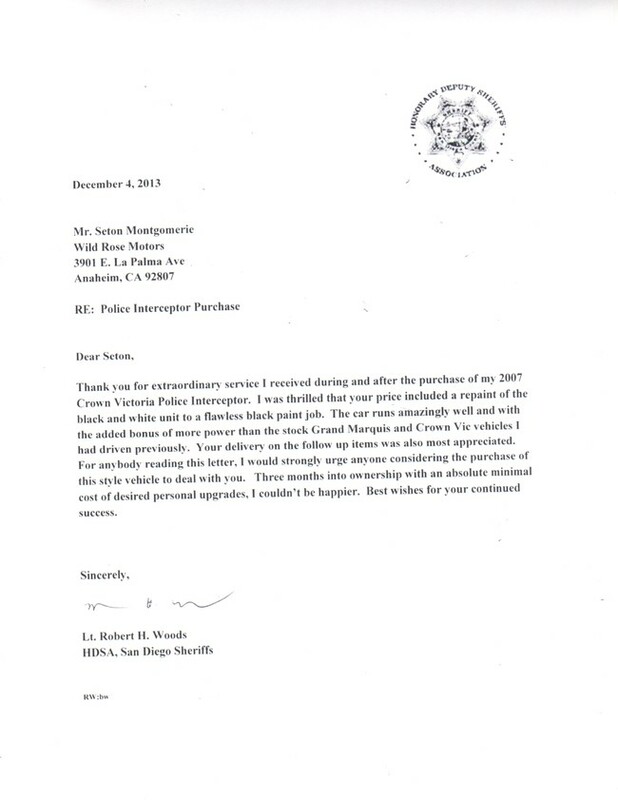 Having no experience in used police vehicles, I was aked to purchase the vehicle within one week from any source in the Western United States. I had been given a very tight deadline which will directly affect the success of our technology. Luckily I was able to quickly weed out the multitude of Interceptor vehicle sellers around the country, and contacted Seton Montgomerie at Wild Rose Motors. Steve was a delight to talk to over the phone. If anything, he was amusing, as well as cordial, but professional. He made an otherwise stressful decision and process, very enjoyable. Since I knew nothing about police vehicles, it was his priority to understand what I needed, and asked me the right questions to narrow my eventual selection of a surprisingly clean and great running vehicle. Steve presented all of the Pro's & Con's with each type and model year of the Interceptors in stock; and this honesty was refreshing. But, most of all he also understood my critical deadline, and my desire to get the buyers, he clearly and methodically helped me deal with the inherently cumbersome purchasing bureaucracy of my three offices in California, Texas and North Carolina to produce the necessary documentation, approval and wiring of funds to complete the purchase and deliver our prized Crown Vic. Guess what, I drove off the Wild Rose Motor's lot with a really nice Interceptor in a couple of days. Amazing! I thought it couldn't be done! After a few months of driving the vehicle between system integrators the car developed a slight misfire, and the ''Check Engine'' light was reared it's ugly head. At the moment we were demonstrating our technology to our customers using the Crown Vic, and we feared the problem with the vehicle would jeopardize our activities with our customer. Betwen meetings, I called Steven, and asked me to immediately bring the vehicle to his facility to be checked out. Steve selflessly rescheduled his other appointments to correct the problem in the vehicle and sent me on my way without missing a beat. 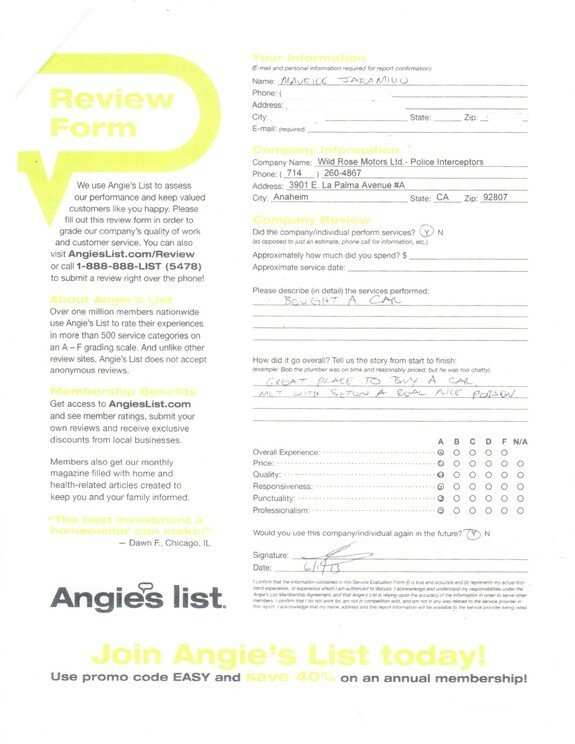 Thank you, Steve, for an enjoyable experience, and splendid customer service. Oh, and thanks for a really nice interceptor, too. ''A rose is a rose,'' someone once said, but I guarantee you, that person never ran into Seton B. Montgomerie and the crew at Wild Rose Motors. Normally, I am a cynical old fart and have been ever since Roy Rogers had his horse, Trigger, stuffed and mounted. So, when I contacted Wild Rose Motors in my search for a Crown Vic Interceptor, I was pretty sure I knew what to expect, but Steve- as Seton likes to be called- proceeded to blow away every one of those preconceived notions I had about the car-buying experience. First of all, Steve and his crew don't just sell cars. These are true Police Interceptor enthusiasts. Not only do they know these special automobiles inside, out, and underneath, but they also seem to understand the nature of those individuals who drive them or want to drive them. Steve addressed my concerns even before I did. He knew exactly what I needed in a car, and more important, he knew exactly the kind of straight-forward, no-nonsense dealings I needed from the individual who sold me that car. Finally, Steve went so far beyond my expectations in servicing and preparing the Interceptor I had chosen, I was left speechless - and let me tell you, that's a neat little trick that a lot of my friends would pay good money to learn! I choose to drive Interceptors because the right Interceptor is strong, reliable, incredibly safe, and because - frankly- the cars exude the kind of attitude a fire-breathing dragon could admire. If you think an Interceptor might be the car for you, then listen to this crabby old cynic; I've talked to dealers all over the country, but I bought my Interceptor from Steve Montgomerie and Wild Rose Motors. Call them, and find out why! Hey Steve and the crew down at Wild Rose Motors. 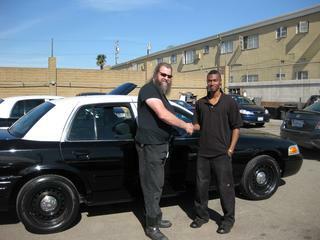 Thanks again for the Crown Victoria; it's a great tool for my new business. I feel I made a good choice by buying this vehicle locally and really feel that I made a good choice buying it through Steve. Solid choices are important as well as fine tools of the trade are and what a great buy. Oh and thanks for the extra equipment my computers will feel right at home I would highly recommend any one looking for a solid vehicle like the cars down at Wild Rose Motors you got to see Steve he will hook you up. 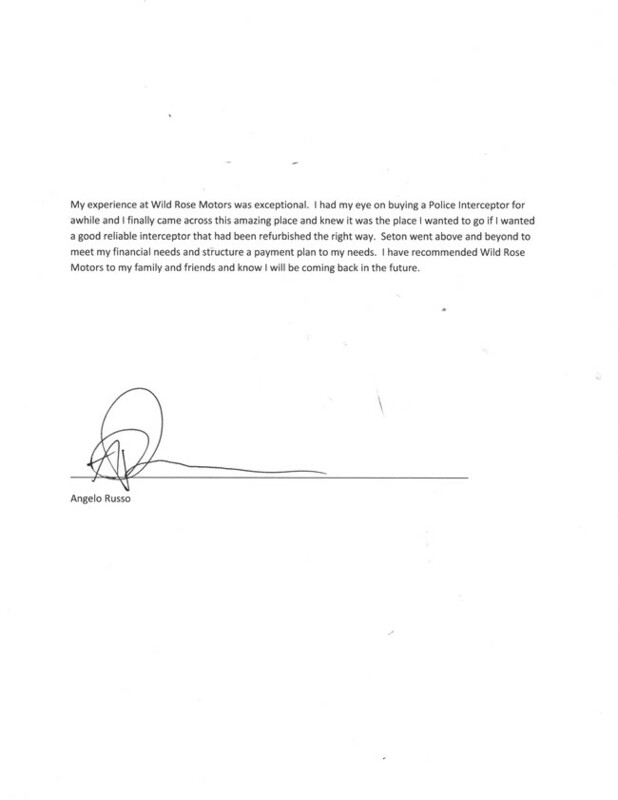 I wanted to take the time to express my overall satisfaction with Wild Rose Motors (WRM). They not only had a diverse selection of vehicles for any budget but they were also extremely accommodating and very professional. I recently reached the one year anniversary with the 2002 Crown Victoria P71 that I purchased and seven thousand miles later it's still running great. I recommend WRM and will definitely consider them for future Interceptor purchases. 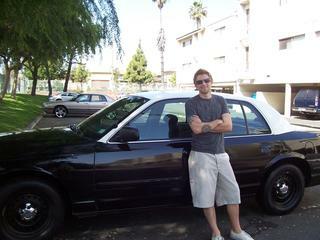 My name is Ian and purchased a 2003 Jet Black CVPI from you guys. Firstly, let me say that you guys are amazing in every way. Let me describe my experience: When I first arrived, I was greeted by Steve. Now, I was expecting him to be just most car salesmen, very pushy and impatient but, as I found out, that wasnt him. He was very friendly and made the car buying process a lot more relaxing. So friendly and relaxed that he let me take the car for a test drive and he wasnt even in the car and after I had purchased the car he replaced the pushbar that came with it for free!! Let me stress that young drivers, like myself, are driving cars harder and faster than ever and, as a result, teen driving fatalities are rising. Teens nowadays settle for cars that are cheap and most times unsafe. Well, the CVPI is extremely safe. So safe that it was given a 5 star crash test rating and tested to withstand rear end crashes at speeds in excess of 75mph. No other car is tested to that standard!!! (See the link at the end of this letter if you dont believe me.) Its this kind of top notch safety that saves lives. Now I dont condone reckless driving like speeding or racing but its always good to have a high level of safety when driving, legally. In conclusion, Wild Rose Motors is the best choice for young people looking for a police interceptor. 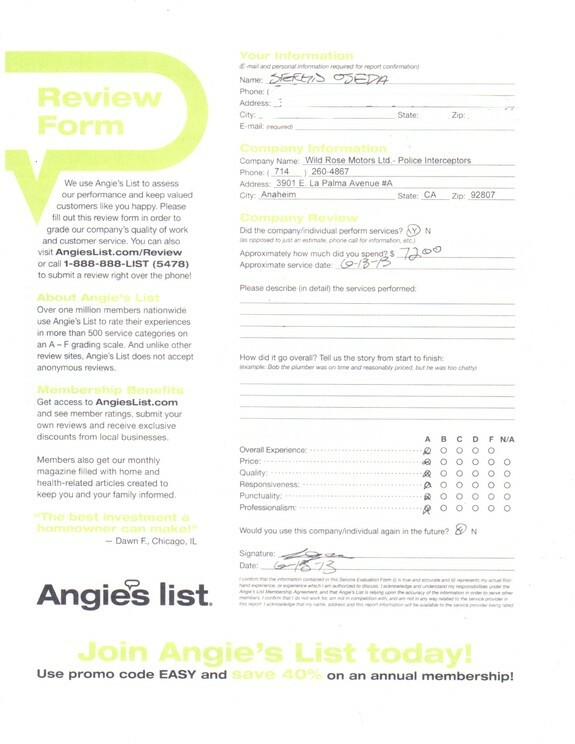 Their service and commitment to their customers rivals that of other big name car dealerships. Not to mention that sell safe, reliable and fast cars. P.S. : Big thanks to Melissa for taking car of the financing. Policeinterceptors.info is great! I recently bought a 1995 Chevy Impala and i couldn't be happier. I reccomend that all my fellow devil dogs do business with them. They appreciate us, and it shows! My name is Jeff. When my last car was about to break down at any moment, I needed a reliable car in a hurry. Since I?m a student, I need something that will run well, and last a while. After going to so many different pre-owned car lots and searching 'sale-by-owner' ads, (literally looking at hundreds of cars) I finally visited Wild Rose Motors and met with Steve. 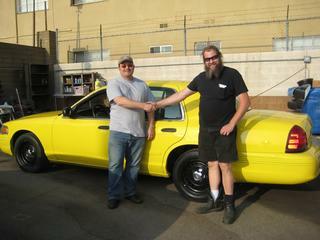 Steve appraised my trade in and set me up with a 1993 crown Victoria in immaculate condition. After all the cars I had looked at up until then, NO car was in as good a shape. The car still runs like a champ, and my only regret is not having gone to Wild Rose Motors first, it would have saved me SO much time and stress. buying another vehicle from Steve. Racheal Gillis came to us at Wild Rose Motors looking for a safe reliable vehicle for her teenage son Aron, as a family owned business that cares about family we were more than happy to help them both find the perfect car, we customized the paint job added push bars and much more just to Aron’s liking, and mom loves the fact that he will be safe behind the wheel of a Crown Victoria P71. Thank you, thank you, thank you for providing me with the best car buying experience I’ve had so far. 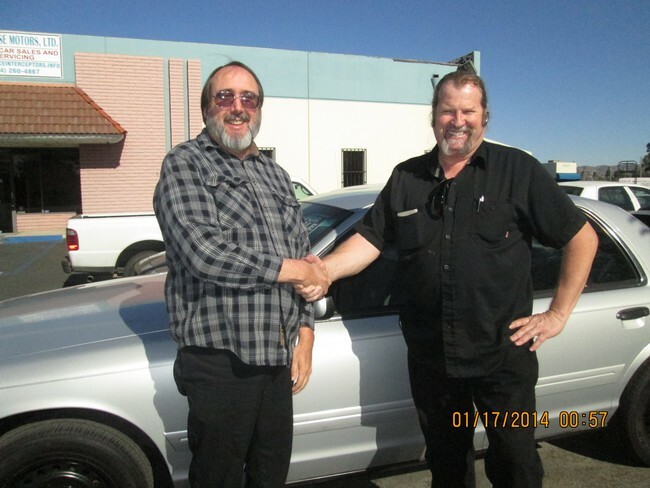 Seton was very knowledgeable, friendly and kind throughout the entire car buying process. My friend and I just dropped in unannounced one Saturday morning, and Seton was more than willing to show us the cars that he had in stock. He also shared with us how his company operates, their vision and their purpose, which is to provide his customers with the best possible P71s, with excellent customer service and dependable vehicle support. I could really hear the passion in Seton’s voice as he showed us his cars, and you can tell that to him these cars are not just inventory that he wants to push out the door, for as much cash as he can get. These cars represent his work and his passion; these are his babies! Seton is basically a P71 minister, burning with desire to spread the P71 gospel to the entire world (can I get an "Amen"). Let me first state that I am not a car guy. I only know the basic rudiments of owning and operating a car. I know nothing about engine stuff, or transmissions, or performance KPls, but I knew that I wanted a car that is Americana, built like a tank, reliable to hell and back, and has a certain cool factor/ je ne sais quoi. The immediate answer was the Crown Victoria P71. I did a lot of research on the P71: the pros and cons, what to watch out for, what qualities are desirable and most importantly where to get a P71 at a great price! I looked at 3 other Crown Victorias before coming to Wild Rose. The first two were P71s listed at local car dealerships. They both looked good online, but in person I could see that they were in horrible condition: one had a chipped wind shield, there were engine knocks, one had to be jump started so I can test drive it, another had interior panels missing, and for both these cars the dealerships wanted $5,000 cash!! The third car I looked at was a P74. It was priced really low, and it had reasonable miles, but one quarter panel had peeling paint, the HVAC blend door actuator was busted so the car was only blowing hot air, and the handling was awkward. I saw other P71 options, but they were either beyond my budget, or too far, or had questionable Car Fax profiles. That left Wild Rose. The main factor that made me initially hesitate about getting a P71 from Wild Rose was that the Wild Rose P71s I wanted were beyond my budget. On this issue of cost, Wild Rose was willing to work with me to find a P71 that was comfortable fit with my budget. They also have in-house financing, to help out guys like me who do not have money trees growing on their apartment balconies. This is all they do! They specialize in P71s! It’s like choosing between a surgeon who does 100 types of surgeries, or a surgeon who specializes in that one, specific surgery that you need. They have access to multiple cars and car parts, so I know where to go in case I want to add options (like a push bumper, unless if by some miracle Seton decides to throw in a push bumper for free *wink *wink). 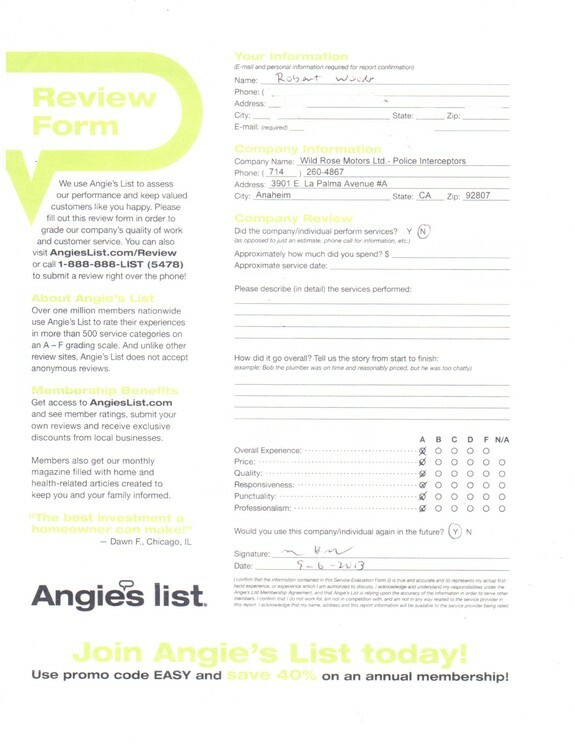 They have multiple Yelp reviews and testimonials speaking about their reliability. So I went with Wild Rose. I am now a proud owner of a black, 2008 P71. She is solid, she is powerful, and she handles like a dream. These P71s are war horses that will keep marching on ’til the end. 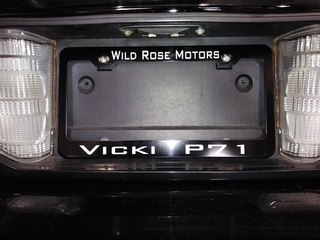 I even ordered an engraved license plate frame to proudly show that I got my P71 at Wild Rose Motors! At the end of the day, I can confidently expect Wild Rose and Seton to provide me with REASONABLE ASSURANCE: based on what they saw on the car, based on their experience, and based on their informed opinion, can they give me REASONABLE ASSURANCE that my P71 will be a good reliable car? I think the answer is YES. And in case I am wrong? I’m not worried. Customer Jon Constatine loved his Crown Victoria so much that he had a custom license plate frame made for his beauty.